The list, released Monday, is intended to highlight those antibiotic-resistant bacteria for which new treatments are most sorely needed. The organization hopes the list will spur the development of new antibiotics by the pharmaceutical industry, at a time when bacteria appear to be evolving resistance to a growing number of drugs. For years, doctors have warned that the looming threat of bacteria resistant to antibiotics could result in a full-scale global crisis with millions of deaths. At present, the CDC estimates that 23,000 die every year from multidrug-resistant infections. A British report, The Review on Antimicrobial Resistance, estimated that globally, 700,000 people die each year from such infections. But the scariest part is that really, it’s difficult to tell just how widespread the crisis already is because it is suspected that many superbug cases go unreported. The new WHO list groups the deadly bacteria into three categories, ranked by priority based on how resistant to treatment they are. In the “critical” category are three families of bacteria— Acinetobacter, Pseudomonas and various Enterobacteriaceae—the often appear in hospitals and nursing homes to cause deadly bloodstream infections and pneumonia. Six other bacteria families were listed as “high” priority, including the bacteria that causes gonorrhea, a common infection that is rapidly becoming untreatable. For those who desire to know all the different ways they might possibly die, the full list of critical and high-priority deadly superbugs is below. Acinetobacter baumannii: These bacteria are highly-resistant to an important class of antibiotics, called carbapenems, used to treat multi drug-resistant bacteria Acinetobacter baumannii causes a range of infections, including pneumonia and wound infections in hospitalized patients. Pseudomonas aeruginosa: These bacteria are also resistant to carbapenems. In healthy people, they typically cause skin rashes and ear infections, but in hospitalized patients can result in pneumonia and deadly blood infections. Enterobacteriaceae: Included in this family are familiar bacteria like Salmonella and E.Coli. These nasties have evolved resistance to carbepenems as well as another class of antibiotics, cephalosporins. Enterococcus faecium: These bacteria show up frequently in hospital settings, resulting in things like surgical wound infections, endocarditis, and urinary tract infections. They are resistant to a common antibiotic called vancomycin. Staphylococcus aureus: The staph infection is a common cause of food poisoning, respiratory infections and skin infections. It’s a big problem in US hospitals, where more than 500,000 people contract it every year. It is resistant to methicillin, an antibiotic in the penicillin class. It’s also growing resistant to vancomycin. Helicobacter pylori: These bacteria, which reside in the digestive tract, can cause gastric ulcers and are recognized as a bacterial carcinogen. They are resistant to clarithromycin, a common drug used to treat ulcers, strep throat, pneumonia and skin infections, among other things. Campylobacter: A common food-borne pathogen, these bacteria are considered to be the most common bacterial cause of the stomach flu and other diarrheal diseases. They are resistant to an important class of drugs called fluoroquinolone. Salmonellae: Strains of salmonella are responsible for things like food poisoning and typhoid fever. These bacteria are also resistant to fluoroquinolone. 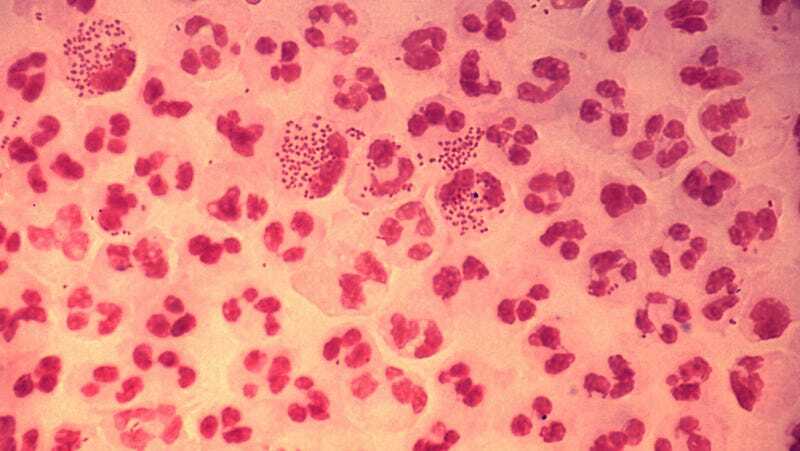 Neisseria gonorrhoeae: This is the bacterium responsible for gonorrhea. It can also cause other nasty things, like meningitis and conjunctivitis. It’s resistant to both fluoroquinolone and cephalosporin. Streptococcus pneumoniae: This common superbug causes things like ear infections, meningitis and pneumonia and is the leading cause of vaccine-preventable illness and death in the US. It is growing increasingly resistant to penicillin. Haemophilus influenzae: Known commonly as the “bacterial flu,” this bacteria causes things like ear infections and pneumonia in babies and young kids. A vaccine works on some strains, but not all of them. It is resistant to ampicillin. Shigella spp. : Not to be confused with the shingles, this food-borne pathogen results in dysentery. It’s currently resistant to fluoroquinolone.